On Friday, we flew to Christmas Island. Of course the plane was late. Eventually we arrived, adjusted our watches to accord with the half hour time difference from Cocos and drove to our accommodation. We were staying at Cocos Padang. I hadn't stayed here before and it was most acceptable. The group divided into two: those who had visited Christmas before and those who hadn't. This was my fifth trip to Christmas Island, so I fell comfortably into the first group. We drove around the island and were shocked to see how very dry it was. Richard had warned us that things were dry, but hearing about it and actually witnessing it were two different things. Finding new birds in these conditions was going to be difficult. There were many more Island Thrushes than on my previous visits. There has been a concerted effort to remove feral cats from Christmas Island and we saw several cat traps on our travels. This is paying off. I saw just two cats on the island - both of them domestic moggies in the township of Settlement. More noticeable was the increased population of Island Thrushes. They were abundant, and I'm sure this is a direct result of the cat eradication program. 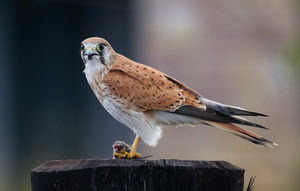 Kestrels and Christmas Imperial Pigeons were always abundant. Other birds we saw every day were Christmas Island Swiftlets, White-tailed Tropicbirds (including Golden Bosunbirds), Red-footed Boobies, Great Frigatebirds and Christmas Frigatebirds. Alas, the Red-billed Tropicbird I had searched for on my previous visit was no longer present. The poinceanas were looking beautiful. The poinceanas were in flower and looking beautiful. The red crabs were migrating. Many roads were closed and some were open that should have been closed. On several occasions we had a few spots of rain, but not enough to get properly wet, and certainly not enough to satisfy the rainforest. At Swift Alley we enjoyed lots of Abbott's Boobies, but no swifts. 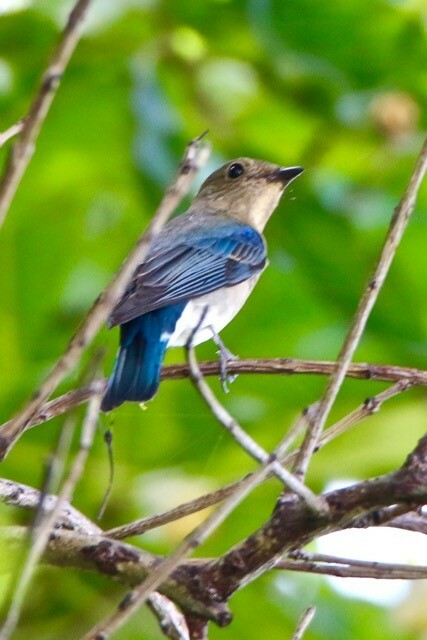 On the road to Dolly's Beach, white-eyes, thrushes and Common Emerald Doves enjoyed pools of water on the road, provided by a natural spring. We visited the farm, hoping to see the Yellow Bittern that was present a fortnight ago, but it was nowhere to be seen. 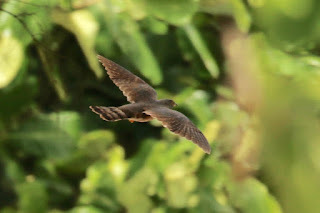 We went spotlighting a couple of times, first to see the endemic boobook, then looking for nightjars. We saw the Christmas Boobook, but there was no hint of nightjars. My one hope for a lifer on Christmas had been a Savanna Nightjar, which I had heard calling on two separate occasions on previous visits. It was not to be. I saw Yellow Crazy Ants on the handrail at Margaret Knoll. Millions of dollars have been spent trying to eradicate these pests, and it is unclear whether or not the program will be successful. The ants were introduced from South America, arriving early in the twentieth century, and were not a major threat for some decades. Then, for some reason, they formed supercolonies, and immediately became a major problem, killing red crabs and destroying the environment. The national parks experts are attempting a biological control of the ants, using a tiny wasp that destroys the ant's main food source, an introduced scale. Let's hope it works. Rob and I attended a fascinating talk about the captive breeding program for two lizards, both extinct in the wild. One was the Blue-tailed Skink and the other Lister's Ghecko. The idea is to breed them up in sufficient numbers to re-introduce them to their former home. Although this was my fifth visit to Christmas Island, I did two things I've never done before: I walked to the Dales (which was lovely) and I took a boat trip around the island (which was most enjoyable). The boat trip was predominantly organized for snorklers, but I admired the scenery and the birds and certainly got my money's worth. Despite being so dry, the island is always a very special place. The rainforest is serene, the frigatebirds are mesmerizing and the crabs are fascinating. It's sad to see the casino deserted. I will have to go back. Apart from anything else, I have an appointment with a Savanna Nightjar. 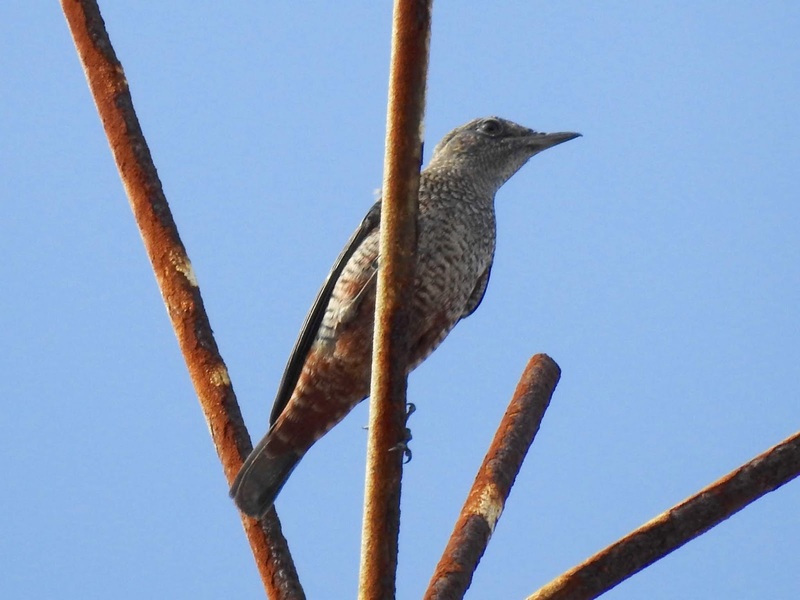 I had booked on Richard Baxter's tour of Cocos and Christmas Islands and, as we stopped in Perth on the way, it was an opportunity to pick up the two Western Australian birds I was missing: the Crested Honey Buzzard and the Western Quailthrush. I'd failed on the former before but had never tried for the latter and believed them to be easy. 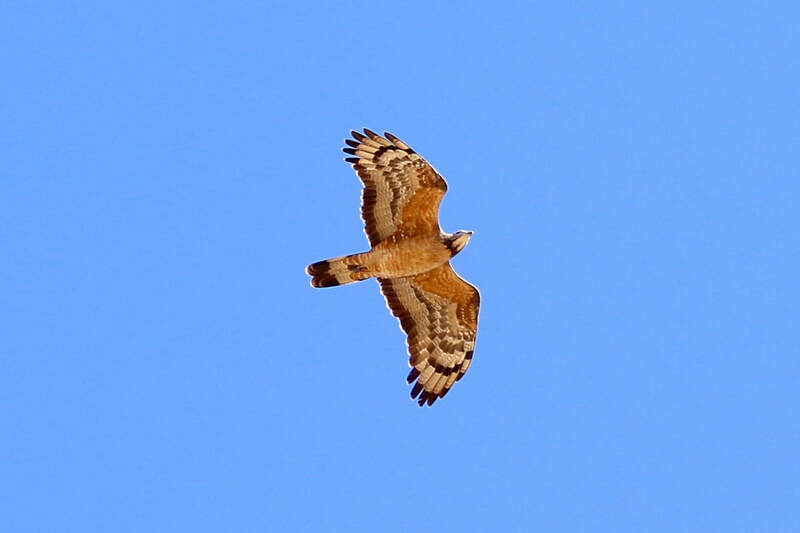 The honey buzzard is migratory and has been turning up at Lake Joondalup north of Perth in mid-November for the last few years. Indications are that it's been present every year since 2010. Naturally, in 2016, the year I went looking for it, it turned up late and I missed out. 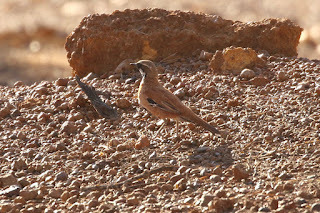 The Western Quailthrush is reputedly found easily on the golf course in Cue, 620 kilometres north east of Perth. 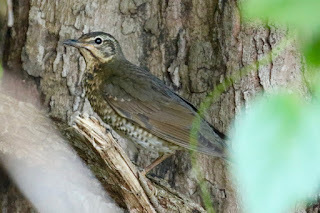 James Mustafa was booked on the Cocos/Christmas trip too and our friend, Steve Reynolds from Perth, offered to take us both to see the quailthrush. He had a good spot for it on Kirkalocka Station. So we were all organized. Or so we thought. The week before we were due to leave, a Purple Heron turned up at Carnarvon! Purple Herons reside in south-east Asia and there had been just one previous mainland record for Australia and one record for Christmas Island. A bird was seen at Herdsman Lake in 2013 by a foreign visitor, who didn't report it at the time. Going through his photos when he was back home, he noticed the heron and reported it. 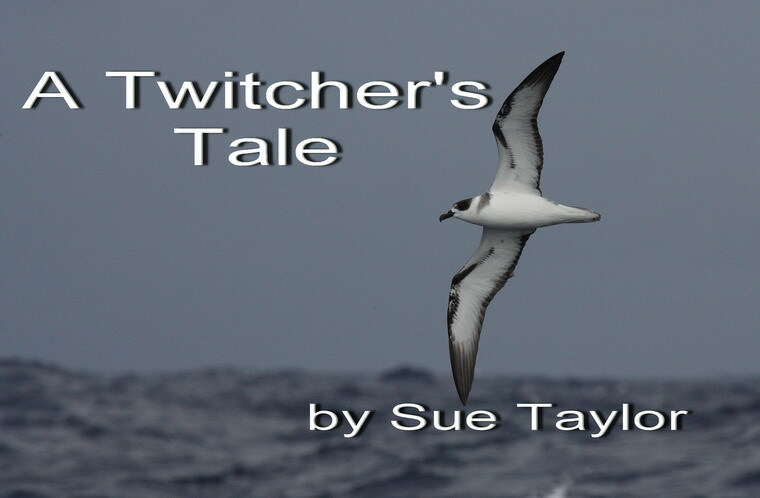 Of course by then the bird was long gone, and no Australian birder had the chance to see it. Carnarvon is 900 kilometres north of Perth. This bird was eminently tickable. This was too good an opportunity to miss. Plans were changed immediately. 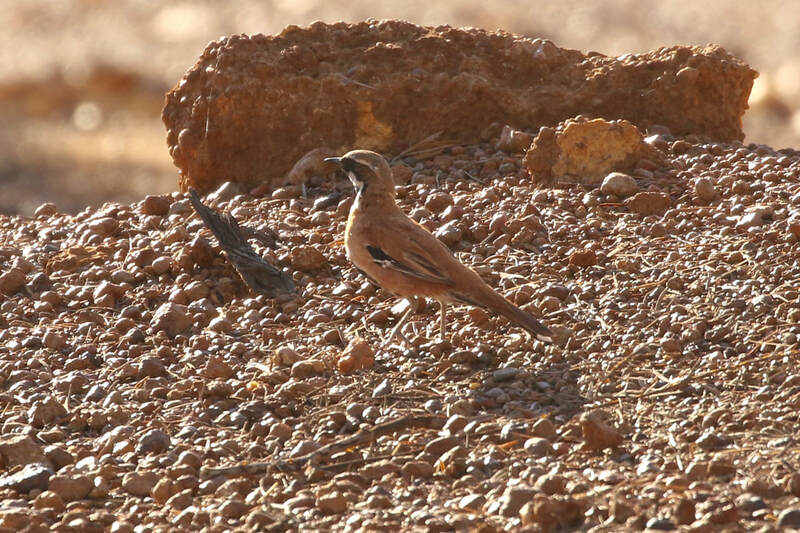 We'd drive to Carnarvon, twitch the Purple Heron and get the Western Quailthrush on the way back to Perth. I flew to Perth on Sunday with a free day to go birding on Monday, before we set off for Carnarvon on Tuesday. 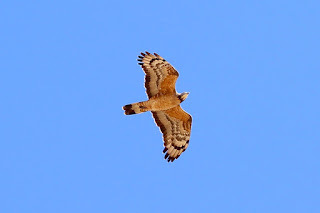 James arrived on Monday and we started birding at Lake Joondalup where the Crested Honey Buzzard was being seen most mornings between 9 and 10. Unfortunately, not on Monday, 26 November 2018. We stood and watched and waited. No buzzard. James attracted a large number of fat ticks - luckily they left me alone. We saw a beautiful bronze coloured small lizard, which we were told was a Buchanan's Skink. Lake Joondalup where James attracted ticks waiting for the honey buzzard. Eventually, we gave up on the buzzard, considered a trip to Rottnest to look for Roseate Terns for James, but found this was impossible because of the ferry timetable. So we decided to walk around Herdsman Lake. Thanks to James, we did all our travelling by uber and I must say it was a very positive experience. At Herdsman Lake I was momentarily excited by a hobby, which I hoped would be a Eurasian one. James (who'd seen both the buzzard and the hobby on a previous trip to Perth) explained that the Eurasian bird has much paler underparts. We admired a Great Crested Grebe swimming on the lake with striped babies on its back, and Buff-banded Rail with black fluffy young chicks. There were several large Bob-tailed Skinks with orange heads. The next morning we arrived at Lake Joondalup before 7.30 for our second attempt at seeing a Crested Honey Buzzard. We stood looking, waiting. Dan Mantel arrived and we stood and waited some more. There were several raptors to entertain (and confuse) us while we waited: Swamp Harrier, Whistling Kite, Square-tailed Kite and Little Eagle. At 9 a.m. not one but two Crested Honey Buzzards appeared. They flew towards us, then right over our heads, giving us all excellent views. Dan said that, of the fifty sightings he'd had of this bird, our sighting was in the top five. James and I were high fiving - he's happy to celebrate my ticks, even if it's a bird he's already seen himself. I enjoyed the warm glow of success known only to happy twitchers for the rest of the day. Steve picked us up and drove us to Carnarvon, a cool 900 kilometres. We arrived around 10 p.m. and stayed in a holiday apartment. On Wednesday morning, we set off for Violet Creek at 5 a.m. James admired Dusky Gerygones - a lifer for him. It was muddy beneath the mangroves but I was delighted there were no sandflies. Very soon after we arrived James and Steve both sighted the heron. I missed out. Would I have seen it if I'd been a foot taller? I don't know. They boys followed the bird around to the other side of the creek. I followed reluctantly, knowing I'd never see this mega rarity. However, when we reached the other bank of the creek (where access was actually easier than where the boys had first seen the bird) immediately, right in front of us, was the Purple Heron! I nearly cried with joy. Two ticks in two days! How good is that? We did some quick birding around Carnarvon. We saw a Long-toed Stint and a White-bellied Sea Eagle at Chinamans Pool and James ticked a Star Finch at Birrawarra Bore. We looked for Roseate Terns on the beach, but they weren't cooperating today. For some reason Kirkalocka Station had closed its accommodation, so we arranged to stay at Mt Magnet Caravan Park. We went spotlighting but all we could find were some very noisy, very tiny brown frogs and an interesting microbat. On Thursday morning, we left at quarter to six and drove straight to Kirkalocka Station. Within 5 minutes of arriving, we'd had great views of Western Quailthrush! That was 3 ticks in 3 days. I was feeling pretty good. We'd driven 2,500 kilometres and I'd seen 133 birds (naturally, the boys saw more). The quailthrush was my 816th Australian bird. I was ready for Cocos.